NEW YORK - May 12, 2013 - PRLog -- ProvenTherapy.com has been there on the cyber world for many years, providing 'healing touch to troubled hearts and souls' according to its previous business slogan. Now it has 80 approved ProvenTherapists practising 24X7 and the number is growing. The premier online counseling and psychotherapy service has changed its business tag line to 'online counseling for life's journey' with the aim of adding positive color to its healing mission. 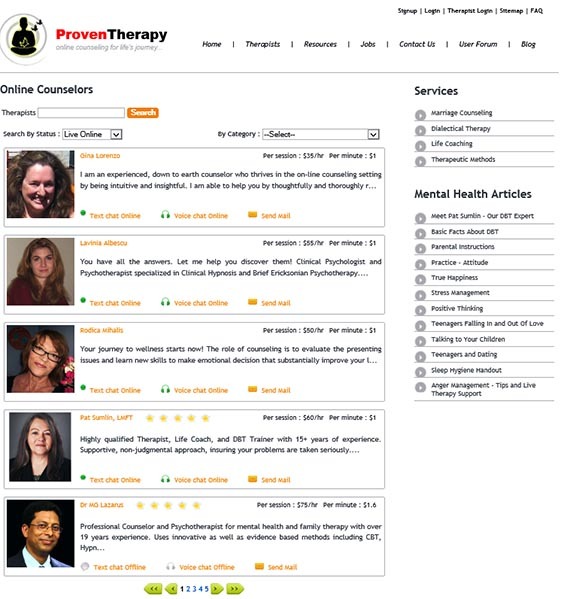 https://www.proventherapy.com provides online counseling and psychotherapy through live text chat, live voice chat, and email for mental health as well as relationship and personality problems by professionally qualified and experienced Counselors and Psychotherapists. The website is digitally encrypted through SSL layer protection for enhanced data security in order to keep client confidentiality.